No, I’m still not done with salads. It’s only July, and all those salads I see in books and magazines continue to catch my eye. In the April issue of Food and Wine, there was an article about wine country recipes in which chefs from four different wine regions around the world presented dishes that pair well with their local wines. The regions represented were northern California, Mediterranean France and Spain, coastal Chile, and south Australia. This salad is from Armand Arnal of La Chassagnette outside Arles. Some interesting ingredients and flavors are combined in the salad, and I made one substitution but probably shouldn’t have. As you see in the title, my version of the salad included yellow squash, but zucchini was used in the original. As it happened, I had a yellow squash in the refrigerator but I had used all the zucchini. I thought it would be pretty much the same difference. The problem, however, was the color. You see, this salad also involves the use of preserved lemon, and once the lemon rind was sliced, it looked very much like the sticks of yellow squash. In fact, as Kurt was eating his salad, he started pushing the yellow things to the side of his plate and said that he didn’t require that much lemon. I had to explain that all that yellow stuff was squash which he then ate while realizing the actual quantity of lemon was just right. The first step in preparing this salad was marinating the zucchini or squash in olive oil with thinly sliced garlic, cumin, lemon zest, lemon juice, salt, and pepper. Plumped currants were added to the squash, and it was left in the marinade for two hours. At the same time, chicken was marinated in olive oil with minced shallots and lemon juice. Then, pine nuts were toasted, the chicken was sliced and sauteed, arugula was cleaned, and the preserved lemon peel was slivered. All of those items were then tossed in the marinade with the squash and currants. It came together very simply once the marinated items had been prepared and allowed to sit. For a simple salad of some chicken on some leafy greens, there was actually a lot going on here in the flavor department. 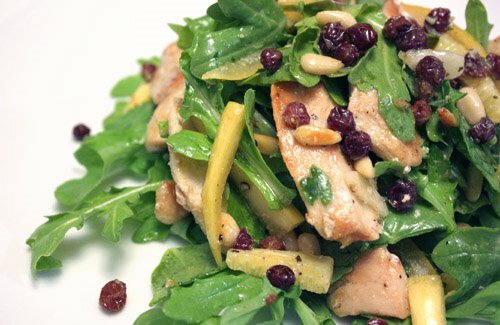 The pinch of cumin added an interesting hint of earthy spice, and the sweet currants balanced the peppery arugula. The lemon juice and preserved lemon peel were bright notes in the mix, and the marinated chicken made it all deliciously more substantial. This was a thumbs-up meal, and it’s going into the permanent file with one note: don’t willy-nilly substitute yellow squash for zucchini. My lesson of the day was to always remember that color can matter more than you might think in a dish. Lisa, this salad looks so light, fresh, and tasty! And, I always love fruit in salads..mm. A salad like this proves that 'hearty' doesn't mean 'heavy'! This would totally satisfy as a meal in a totally refreshing way. And you've made a wonderful point about color that I hadn't considered before: instead of just being for visual appeal, it can really signal what a person can expect before they taste. In Kurt's case, he thought it might've been an overload of lemons! Lisa, you know what...Yesterday I was craving chicken and asked anyone on twitter for a yummy chicken recipe. Your chicken salad just comes in time. Thanks. It looks tasty and refreshing. I love salads as easy yet so yummie as this one! lisa-did you preserve your own lemon? that's next on my list...looks perfect! chicken salad and chicken noodle soup are really the only things i've missed in 20+ years of vegetarianism. if i ate chicken you bet i'd be eating this wonderfully creative take on an old standby -- lovely, as always. Keep them salads coming. I don't mind. Besides the season is definitely right for them, so why not. love the flavors in this. I think I'll eat a salad today. I think yellow squash is adding a nice color for the salad. Love the pine nut in there! Never seen squash in a salad. Can you believe that? You've got so many great flavors in there. Lemon and pine nuts alone, we're sold! 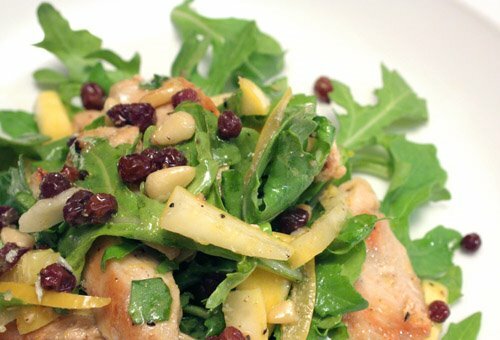 This is a very nice chicken salad...it is a meal itself...love the addition of raisins and pinenuts...yummie for summer. Perfect lunch for these hot days here. This is a wonderful recipe for me to use zucchini! I've never thought about this color issue before, either. As you say, it sometimes matters a lot more than we think. Currants look like a lovely touch on your salad. I love a good chicken salad. I have bookmarked this page for making it in summer. Pine nuts and squash! What a fabulous addition to chicken salad! Love it! I love the marinated squash!I think this is an uber tasty dish! You really are on a salad roll! Me too actually as this is the perfect salad season after all. Brilliant idea of marinating the zuchini (squash) I've never marinated veggies before so that might be interesting to try! this looks great. your photos are beautiful! This salad is very special indeed, the marinating method sounds very attractive. I'm totally with you on the salad kick; I feel very virtuous... but loving it! I love all the ingredients of this one - hurray for currants! Dried fruit in salads (cranberries are my favourite) makes me a happy, happy girl. Never be done with salad please!!!!! There should be a blog JUST about salads! They deserve it!!! What a beautiful salad! I love the squash addition, it looks so healthy and flavorful. I am loving all the salads! This one sounds really delicious - despite the yellow mix-up. What a lovely salad - the squash and lemon sound so perfect together! I can't wait to try this salad! It looks amazing. Just at first glance I know I would like a plate...I had a really good salad the other night when we ate out with friends! This looks so refreshing! love the sound of that salad dressing.